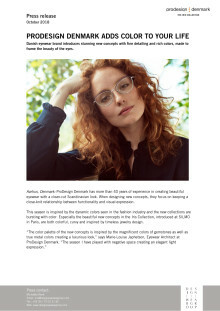 Danish eyewear brand introduces stunning new concepts with fine detailing and rich colors, made to frame the beauty of the eyes. This season is inspired by the dynamic colors seen in the fashion industry and the new collections are bursting with color. Especially the beautiful new concepts in the Iris Collection, introduced at SILMO in Paris, are both colorful, curvy and inspired by timeless jewelry design. For this series ProDesign Denmark has looked at brooch designs and how they use the negative space to create a new shape. The thin delicate metal frame with its gap over the lens creates an elegant lifting eyebrow effect, which is enhanced by a thin strip of contrasting color matching the thin block acetate temples. These new titanium frames have dusted metal colors and matching acetate end-tips. The two lines from the front of the frame twist like twine creating unique temples. The open end-piece lifts the eyes giving a flattering “cat-eye” look. Note the hidden flex hinges making the frames fully adjustable and comfortable to wear.